Shakaden is going to be shown in the latest music video of will.i.am which is open to the public on You Tube now. Shakaden is going to be shown in his latest music video,#thatPOWER ft. Justin Biever. The video is being shown on You Tube from April 19th, 2013; and large number of viewers throughout the world already have been enjoying it. The shooting of this video has been made in front of Shakaden in the end of March this year when cherry blossom was scattering and look like a dance. The director of the shooting team liked Shakaden very much. In fact, the total numbers of shooting increased substantially than originally scheduled on the shooting day. The shooting schedule was also extended from one hour to three hours. You can watch the music video from the link below. In his Facebook, will.i.am shares the photos that were being shot in Shakaden with everyone. 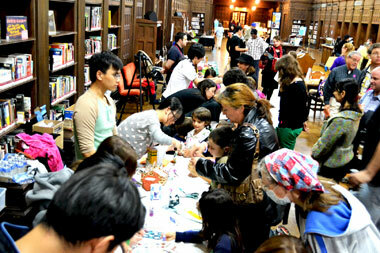 The Bazaar – Sharing of Love hosted by the Youth Group Society was held at the Inner-Trip Centre in Pusan on December 9th, 2012. 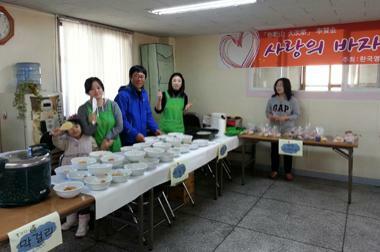 A variety of goods including Korean cuisine and handmade soaps were for sale. Reiyukai Thailand and the Department of Social-Youth Development of Thailand jointly hosted the 28th Youth Speech National Competition at Bangkok, the capital of Thailand, on November 2nd, 2012. Based on Adapting oneself to others and circumstances as this year theme, ten contestants who were selected from nationwide expressed their own thoughts and experiences. 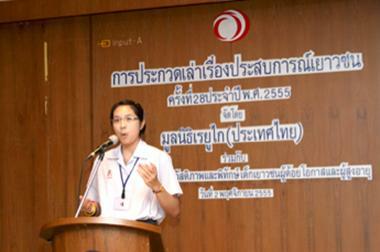 The speech competition was broadcast on the Thailand TV across the country. 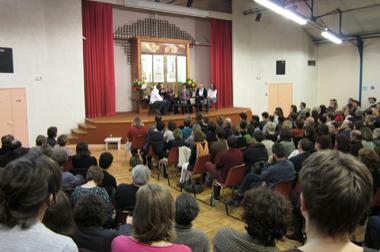 Reiyukai France was organized by Mini Mirokusan Training Session with 607 participants divided into two groups. 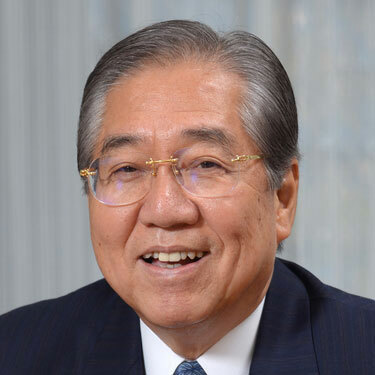 Reiyukai France has been actively working on its activities with a focus on tsudoi under the name of France Hoza with over 25 members and expanding its membership. In this Mini Mirokusan Training Session, the participants from each France Hoza joined in the various programs of group meetings and deepened the interchange among them. 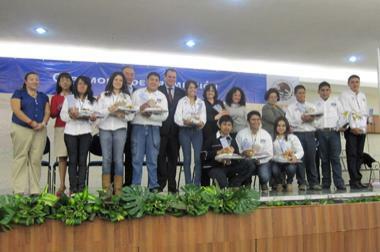 The 20th Letter to My Parents National Contest was held jointly by the Mexican Ministry of Education and Reiyukai Mexico in Pachuca, the state of Hidalgo, on August 9th and 10th, 2012. There were about 5,500 entries from all over the country, and the twenty finalists who were selected from each regional contest made their presentations. On behalf of the host organizers, Mr. Carrion, the Director from the Mexican Institute of the Youth, delivered a cordial greeting. 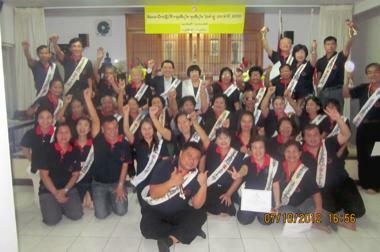 Thirty-seven qualified members above Hozashu participated in the Qualified Members’ Training Session held at Reiyukai Thailand Office in Bangkok on October 7th, 2012. Mrs. Hiroko Nakabayashi, the Chief of Reiyukai International Promotion Committee, emphasized: Continuing the same unfruitful attempt done in the past can produce nothing at all. It is important to overcome your weak points and bravely challenge a new thing. No matter how hard you think in your head, no result will be obtained unless you actually put it into action. 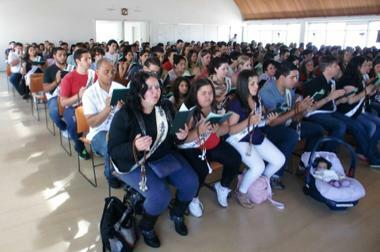 The YGS Leaders Training with the participation of 283 youth leaders was organized in Reiyukai Brazil Center on August 25th and 26th, 2012. The objective of this training is to revitalize YGS in each region and create more new qualified members by spreading happiness acquired through carrying out of the Reiyukai Teachings. Except Brazil, the representatives came from Japan, Peru, Paraguay, and Bolivia. Mrs. Akiko Kawagishi, the Deputy Chairperson of YGS in Japan, said: If you wish to introduce the Reiyukai Teachings to someone, and change yourself, express a sincere appreciation to your parents. The number of your doing michibiki equals to the size of your acceptable mind; and it gives you strength and makes people around you cheerful. The local young leaders deeply identified themselves with her message. 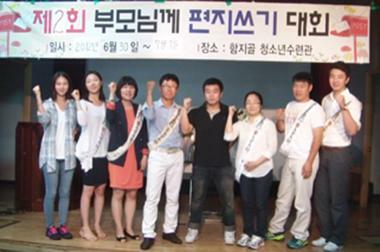 The contest, now in its second year, was held at the Hamjigol Youth Center of Yong do-gu in Pusan on July 1st, 2012. A feeling of gratitude to one’s parents which every child has expressed by nine young men, and their presentations touched the crowds’ hearts deeply. The contestants gratefully said that they were glad to be able to tell their feelings honestly to their parents through the contest.